Best Buy has agreed to pay around US$121 million in cash for online music retailer Napster, the companies announced Monday. For the money, Best Buy gets a database of 700,000 subscribers to Napster's digital entertainment services, and its Web platform for streaming music. Best Buy foresees using that platform to sell content other than music, it said Monday. 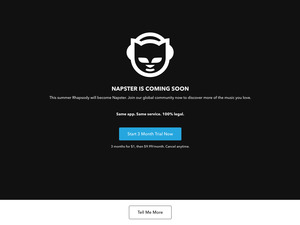 Napster revamped its music download service in May, offering 6 million music tracks in MP3 format for sale without DRM (digital rights management). Best Buy has owned part of Napster since December 2004, when it paid $10 million for a stake in the company in a joint marketing agreement. Napster's board of directors has agreed to the deal, which the companies expect to close in the fourth quarter. The purchase will cost Best Buy around $54 million, after taking into account Napster's cash reserves. Best Buy said it does not intend to make significant staffing changes. Under the terms of the deal, Napster CEO Chris Gorog and other managers will remain with the company.